Ok, we have a thread to discuss controller options for the CV2 already, but there are some technical issues that I would like to discuss here. $ 150,- for a new CV2, without the possibility of using the Steering Wheel and Roller Controller. By modules I meant devices that use the expansion port, so driving controller and roller should work. Whoa your going to make a new CV system!! the Opgrade Module! could it be added into the system? As one machine? Either way, I'd love to have a new colecovison tired of the old graphic glitches. Sign me up! It will have to be decided at one point if a brand new casing will be designed, or if the CV2 PCB will be designed to fit inside existing CV console casings. I can agree 100% that a brand new casing would be preferable, but it will also make the end product much more expensive to produce, and the end price will go up significantly because of it. Recycling old CV console casings would probably be a more "messy" operation, as we'd need to find these casings, drill new holes in the back of each one, and print new stickers to slap on the front of the consoles (perhaps a golden strip, instead of a silver one, to differentiate the two models?) but that would be infinately more economical, and it would serve to greatly reduce the end price of the product, while still maintaining the visual recognizability of the console, which is also a big plus in my book. Another big plus is that broken CV consoles are a dime a dozen. We can find at least a dozen of them on eBay every month. A quick clean-up to remove dust and dirt, and they are ready to receive the new CV2 PCB. We're not a big company with large resources and a large customer base. I know a new modern casing would be preferable, but we do need to keep both feet on the ground here: In the end, those who will be interested in buying the CV2 will care more about the price than the outer casing. We're talking about 25-year-old Z80 technology, and price-wise, we do have indirect competition from other gaming platforms such as the Game Boy Color and Game Boy Advance, which can be bought today in good working condition well under 100$. Customers who are not ColecoVision fans to begin with will buy this thing out of curiosity, and plain curiosity has a much lower psychological price threshold than nostalgia. If we can keep the price under 150$ with a brand new casing, that would be great, but it's not really the question here. The real question is whether people would prefer to pay 150$ for a new casing, or around 75$ for the same product in a recycled casing. I'm fairly certain a majority of AtariAge members will go for the 150$ solution, but that is a strongly biased collective opinion, as most AA members have enough disposable income to justify a 150$ purchase based on pure nostalgia mixed with the desire to have a modern piece of hardware that's not as problem-prone as the original. We need to think outside the AtariAge community, and try to guess the reaction of potential buyers who will stumble accross the CV2 while they're surfing online. Those will look at the pricetag first and foremost, and at 150$US, a lot of them will say "Hmmmm... No thanks." Any way you look at it, a technical solution that keeps the price down to around 75$ deserves to be seriously considered, even if it's less appealing. I'm guessing the CV2 will have a new BIOS, which will mostly be directly inherited from the alternate BIOS of the Opcode Super Expansion Module. I think the details of this new BIOS should be discussed in this thread. Edited by Pixelboy, Sun Jan 3, 2010 9:42 AM. I would say that roller controller and driving controller must work with CV2. The 2600 expansion module I would say spend minimal amount of resources to get it to work and if it's not feasible with a reasonable amount of resources then dump it. The controllers should be 100% compatible with the existing CV controllers. Those are all good points, however Andre said me to create the board first and worry about the case later. The reason is simple, without a board there is no way to know the size of the case, the required openings, the fixing points, etc. About price, we will try to push the CV2 as a hobbyist system. Andre has a couple of system at $150+ range, the One-chip-MSX was released in Japan for $200 and sold 5,000 units, so I think we can sell ok at $150. Besides, Andre believes that a little more powerful system would sell better for hobbyist. The idea is a system that is easy to program but still powerful enough to allow user to create most simple games. The V9990 seems to offer that, we just don't know yet if it fits the budget and if it is available in quantities (but we will soon). So our idea is to try to expand the CV2 beyond the core CV fan base, and bring new blood in terms of game development. I think everybody wins with that. Core for the idea is Compact Flash or whatever we end using for mass storage, because that allows for easy game distribution. But nothing is set is stone yet, I will have a meeting with Andre today and we will discuss a lot of things. For now the idea is to make the best machine we can for $150, and create the smallest possible board (using CPLD/FPGA for all the glue logic). We will start discussing BIOS once we have the hardware defined. About Andre coming here, it is possible but I cannot promise anything. He seems a very busy guy, he said that he sleeps like 3 hours a day, in fact many of the emails I get from him come around 3~4am. His function in this project is as a technical consultant and will take case of the whole manufacturing process. Considering how electronics have advanced in the last 25 years, I'll be surprised if a PCB solution that fits inside a CV console casing cannot be created. But anyhow, while I was at the gym earlier today, I had a thought: Let's say you go with a brand new casing and a 150$ price point. The CV2 is released and sells well enough, but you get some consumer feedback that indicates that many of them find the price tag a little too steep, but they still find the CV2 interesting and would buy it if it was a little less expensive. How about using the CV-casing-recycling idea for an alternate CV2 product? It could be released about a year later as a sort of do-it-yourself kit. The kit would be composed mainly of the PCB designed specifically to fit inside the CV console casing, and a few secondary items, like an easely-removable sticker that would act as a guide for drilling extra holes correctly in the back side of the casing. Some customers will do the work themselves, while others will mandate someone else to do it for them. Doubledown could get a lot of business from that. And also easy game development and testing. Alright, I don't have a problem with the hobbyist angle as long as there's still a CV cartridge port on the thing. Sounds good. But I don't know André at all, and I just hope he won't come to champion the idea of dumping CV legacy game support as a means of simplifying the "modern hobbyist gaming system" angle. If that were to happen, my interest in this project would fall down to absolute zero. Which one? I found several projects on the net called "Pandora". -$150 is very, very good. I would especially like the roller and wheel controllers to work with it, but the 2600 feature is definitely not required. ADAM also. Seems like you're on the right track. There's no point in adding compatability with the ADAM module. It would only be of use to about -3 people. Nothing missing that I can find. A new/modern CV2 console should be very popular, and the price point sounds very good. Would "recycling old CV console casings" actually work? Using old console casings may not hold up very well. Would the older cases crack or break when trying to modify them? A new case, designed to fit the board, sounds fine, and should last longer. Maybe (if possible) a case modeled after the original? Something that looks like it came from the past, even though it is brand new. [EDIT] BTW, the Z80 in the picture is just for illustration purpose. 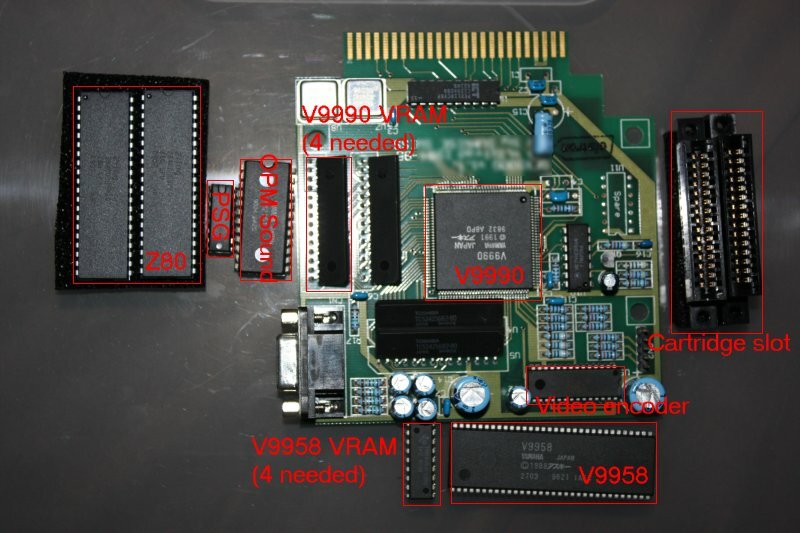 That is the Z80 inside the original CV. The CV2 should use a SMT part though, much smaller(probably 1/4 of the size) and faster (probably 4 times). [quote]But anyhow, while I was at the gym earlier today, I had a thought: Let's say you go with a brand new casing and a 150$ price point. The CV2 is released and sells well enough, but you get some consumer feedback that indicates that many of them find the price tag a little too steep, but they still find the CV2 interesting and would buy it if it was a little less expensive. How about using the CV-casing-recycling idea for an alternate CV2 product? It could be released about a year later as a sort of do-it-yourself kit. The kit would be composed mainly of the PCB designed specifically to fit inside the CV console casing, and a few secondary items, like an easely-removable sticker that would act as a guide for drilling extra holes correctly in the back side of the casing. Some customers will do the work themselves, while others will mandate someone else to do it for them. Doubledown could get a lot of business from that. I need to check that with Andre. The problem I see is that different cases mean different boards, different manufacturing costs. There will be, this a CV project first and foremost. Anyway, what he was trying to mean is that once it's time to manufacturing, a pre-order process will start and people will need to pay in advance to cover the manufacturing costs. You pay, about a month later the console is back from China already assembled and it is shipped to you. We should do that for groups of 100 people minimum. If we can get more than that for the first batch, the better, price should be lower. Edited by opcode, Sun Jan 3, 2010 2:49 PM. Sounds gooder and gooder all the time! As far as cases, I'd prefer a newly designed case if at all possible. i agree with the 2600 module compatibility being low on the list. as for the case...if the new board is close to original board's size, i could come up with my own case if i had to. Edited by frank_c, Sun Jan 3, 2010 4:53 PM. A fast Z80 with a V9990... Imagine a Turbografx-16 that's backward-compatible to the ColecoVision! That's pretty much what is being proposed here! Of course, it would be a totally different project. But then, it's mostly a question of re-arranging chips and components from the existing (and working) CV2 into a new configuration. Not exactly the most challenging thing to do for experienced individuals. Ooooh, nice little piece of hardware! Doubledown has been modding CV consoles for years, and I don't think he's ever cracked a casing while drilling holes for A/V or S-Video outputs. The plastic itself is pretty sturdy. I do believe it's ABS plastic. Actually a bit better than that. The V9990 was supposed to be the X68000 killer in Japan, with a similar set of features, but much more reasonably priced. start with a pilot hole, then drill slow and it'll be fine. i did the 8 Bit Domain mod and drilled holes for the jacks with no problem. I justed talked to Andre again. We discussed lots of ideas. 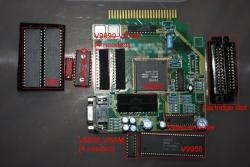 He suggested replacing the CF with SD card, increasing the MegaRAM to 1MB, putting PCM playback inside the CPLD/FPGA. We also discussed a design plan. I do hope you'll be keeping the extra MSX PSG... Unless the MegaROM MSX ports are no longer in your plans? Selling the CV2 in the thousands is possible, but it all depends on public exposure and general publicity strategies. Let's just say that to reach those kinds of sales figures, you can't just rely on word of mouth. Some coverage in certain gaming magazines would help, or perhaps a nice mention on SlashDot.org. But you need a finalized product to get that kind of coverage. A prototype demonstration wouldn't cut it, especially if you're counting on impulse buys from potential customers. Actually I would be way more than happy if we manage to sell near 1K. Damn, 500 units would be fantastic already. Edited by opcode, Tue Jan 5, 2010 9:44 AM. Will the CV2 be supported with software development tools of any sort? Edited by Ransom, Tue Jan 5, 2010 10:01 AM. This may have been stated at some point in the past, so I really do apologize if I simply missed it (I looked, I swear! ), but: Based on the most current vision of what the OpMod (sorry, Super Game Module! ) is going to be and what the CV2 is going to be, what exactly are the differences? Is the CV2 planned to include everything offered in the SGM, but more? Or are they two very different things? If different, will SGM be compatable with CV2, or only the original? On a side note, as much as I can't wait to receive my confirmation e-mail for being on the waiting list, I can certainly sympathise with the craziness surrounding maternity leave opcode. We have a 6 month old at home....luv every minute of it though!